The HEATKILLER® IV VGA series is the result of 15 years of experience in design and manufacture of high-performance water cooling equipment. Only the best of the previous generation was merged with the HEATKILLER® IV VGA Series to provide an even more powerful water block. The GPU cooling structure of the successful HEATKILLER® GPU-X³ series was taken over and improved by the central flow of the well-known HEATKILLER® GPU-X² series. In addition, some improvements have been made. An extremely fine microstructure sits right above the GPU and assisted by a low residual base thickness bringing even better cooling results. The flow was also vastly improved thanks to all channels are constructed as wide as possible. All relevant secondary components, such as memory or voltage regulation module are also cooled with water. Insulating spacers establish the contact with the board, therefore the installation is very simple. Only high-quality materials such as high purity electrolytic copper or the original PLEXIGLAS® GS of EVONIK is used in HEATKILLER® IV VGA series.The production is carried out entirely on a modern CNC machine placed at the Watercool company site in northern Germany. Pre-cut thermal pads for RAM (VRAM) and voltage regulation module (VRM) are already included, along with the installation materials, and an installation instruction. 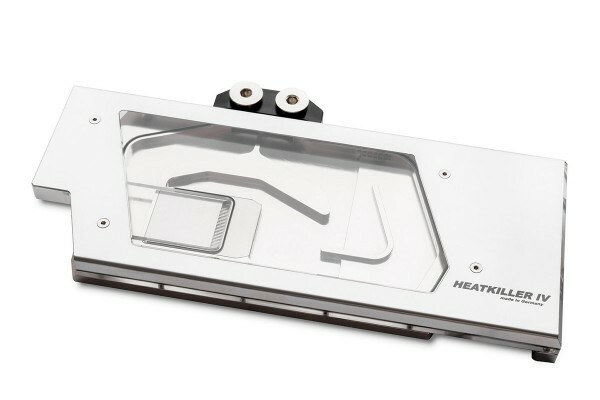 In order to connect several HEATKILLER® IV VGA water block together, the GPU-X Dual-Link and GPU-X Multi-Link are sold separately. A backplate is also available. Please refer to our HEATKILLER® VGA compatibility chart for further information. 2 Vraag (vragen) in andere talen. wäre der auch mit der ASUS Gtx 1070 Strix kombatiebel? Danke! Nein, die Asus Strix setzt auf ein Custom PCB Design während dieser Kühler nur auf PCBs mit dem Layout der Founderedition (Referenzdesign) passen.